(As pictured from left to right) KAREN MATUSINEC, Senior Vice President, Treasurer My team and I create an environment in which talented women can fourish by serving as role models, providing in- teresting work experiences and advantageous assignments, enabling exposure to other leaders, investing in coaching and formal mentoring relationships, ensuring a level playing feld in talent decisions, and ensuring strong representation in our leadership programs. DEBBIE ROBERTS, Senior Vice President, Restaurant Support Offcer, East Division I'm passionate about mentoring and personally mentor several women. I not only encourage women to fnd ways to stretch their skills to grow personally and professionally, but I proactively provide those opportunities when I can. 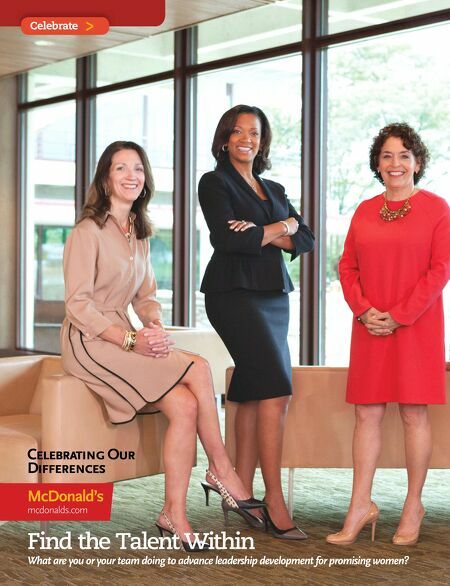 Finally, I'm a proud sponsor of McDonald's Women's Leadership Network. It's a great way to develop skills while making meaningful connections. BRIDGET COFFING, Senior Vice President, Corporate Relations At McDonald's, we have a feedback-rich environ- ment that enables open, candid conversation, rela- tionship building, and a clear articulation of goals and aspirations. I try to make that real and tangible for our future leaders, facilitating their ability to leverage this somewhat unique culture and take advantage of the many opportunities it presents. MARION GROSS, Senior Vice President, North America Supply Chain It's important that all high-potential and top-talent women have strong individual development plans to gain necessary knowledge, skills, and experi- ences to advance. This includes placement in leadership development programs geared to ac- celerate advancement and ensuring that they have mentors, coaches, and sponsors to help guide and manage their careers. 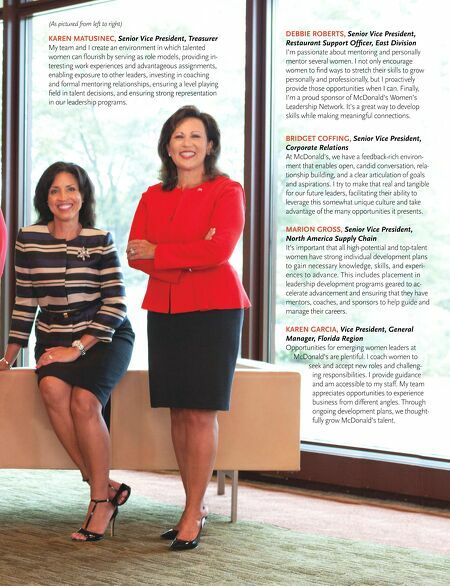 KAREN GARCIA, Vice President, General Manager, Florida Region Opportunities for emerging women leaders at McDonald's are plentiful. I coach women to seek and accept new roles and challeng- ing responsibilities. I provide guidance and am accessible to my staff. My team appreciates opportunities to experience business from different angles. Through ongoing development plans, we thought- fully grow McDonald's talent.